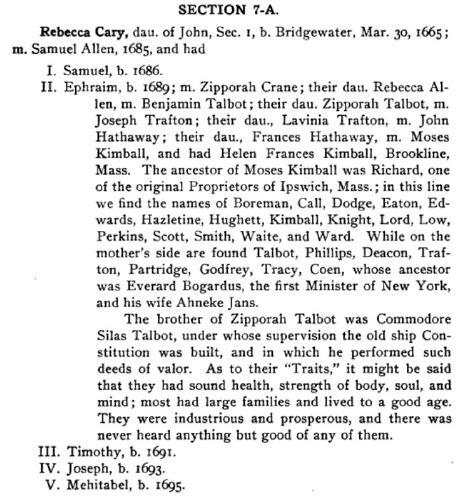 Seth C. Cary, John Cary, the Plymouth pilgrim, Boston, Massachusetts: (1911) , p. 67, section 7-A. Seth C. Cary, John Cary, the Plymouth pilgrim, , at https://books.google.com/books?id=oDgcAAAAYAAJ . Boston, Massachusetts: (1911) , p. 128, section 73. 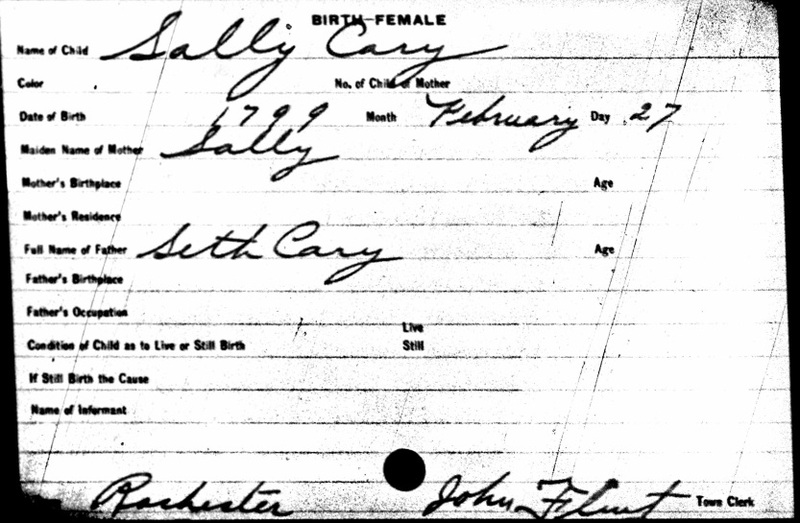 Seth C. Cary, John Cary, the Plymouth pilgrim, Boston, Massachusetts: (1911) , p. 65, section 5. Find A Grave Memorial# 16027287. Find A Grave Memorial# 65447819. Seth C. Cary, John Cary, the Plymouth Pilgrim (n.p. : Seth C. Cary, Dorchester Center, Boston, MA, 1911, unknown publish date), p. 181. sec. 142-D.
Seth C. Cary, John Cary, the Plymouth Pilgrim, p. 181. sec. 142-D says she died 9 Nov 1858. Bradford Kingman, History of North Bridgewater, Plymouth County, Massachusetts, from its first settlement to the present time, , at https://books.google.com/books?id=B-tHAQAAMAAJ . 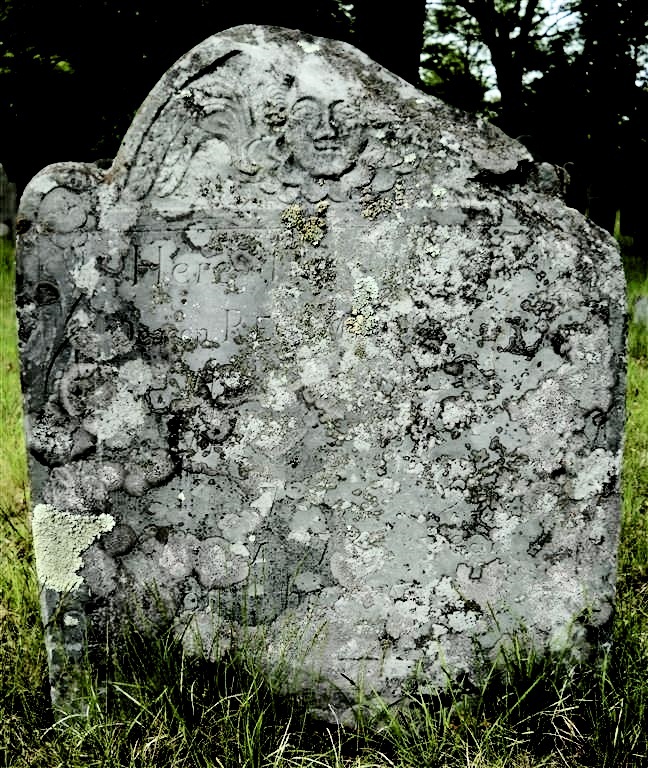 Boston: Published by the author, (1866) , p. 520 says she died 20 Sep 1862. Sarah Cary was born on August 3, 1763. 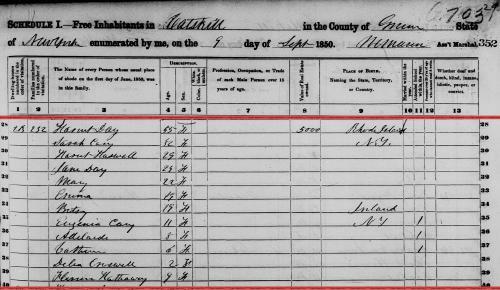 Vital Records of Brockton Massachusetts to the year 1850, , at https://archive.org/details/vitalrecordsofbr00broc . Boston, Mass. : New England Genealogical Historic Society at the charge of the Eddy Town-Record Fund, (1911) , p. 313. Church of Jesus Christ of Latter-day Saints. St. George Temple, Endowments for the dead, 1877-1970; heir indexes, 1870-1956; baptisms for the dead, 1943-1970, Salt Lake City: Filmed by the Genealogical Society of Utah, (1956-1971) , Film Number: 962003, Page Number: 592, Reference Number: 12207. Vital records of Colrain, Massachusetts to the end of the year 1849, Salem, Mass. : Essex Institute, (1934) , p. 153 citing newspaper record of the Greenville Gazette and Courier. Vital records of Colrain, Massachusetts to the end of the year 1849, Salem, Mass. : Essex Institute, (1934) , p. 153, citing gravestone record, Branch Cemetery and newspaper record of the Greenville Gazette and Courier. 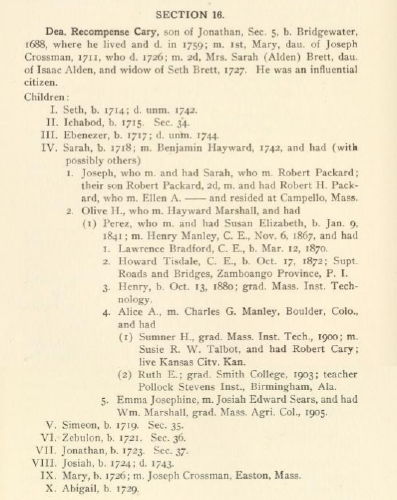 On April 3, 1818 Seth Cary "To Phinehas White, Esq., Chief Judge of the County Court within and for the County of Windham and State of Vermont. That I served regularly in the Continental Army during ... campaign previous to May 1777, and about the middle of May in the same year 1777, I enlisted for term of three years as a private soldier in the Continental army, and served faithfully in the Massachusetts L,ine for and during the said time of three years in the Company commanded by Capt. Zebedee Redding in the 14th Mass. Regiment commanded by Col. Gamaliel Bradford, and was regularly and honorably discharged from the Army at the expiration of of said three years service... the month of May in the year of our Lord 1780. In testimony of the foregoing Declaration I hereunto Let my hand this third day of April in the year of our Lord 1818. 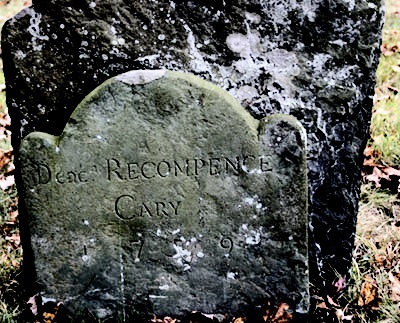 Be it remembered that on this third day of April in the year of our Lord 1818, Seth Carey above named, who now is and for many years has been a resident in the County aforesaid, personally appearing before me Phinehas White, Chief Justice of Windham County Court, made solemn oath, that all the facts stated in the foregoing Declaration by him inscribed relative to the time and ... and of his serving in and ... the regular Army, in the War of the Revolution are just and true. In witness whereof I hereunto let my official signature. I hereby certify that having long been acquainted with the character of Seth Carey, the foregoing applicant, and knowing him to be a man of truth ... am fully satisfied that he serveed in the Revolutionary War as afs'd, against the Common Enemy as is by him stated in his Declaration And knowing that has brought up a large Family, and for many yeears has been much embarrassed in his ... circumstances, and is now in his old age nearly destitute of property, and fully of opinion that he is justly entitled to ... the ... of the late act of Congress. To the Hon. The Secy. of the Department of War -- Phinehas White -- Chief Judge of Windham County Court." PRESENT---Hon. PHINEHAS WHITE, ESQ. Chief Judge. Hon. JOHN ROBERTS, Hon. GILBERT DENISON, ESQRS., Assistant Judges. On this 20th day of June, A.D. 1820, personally appeared in open court, being a court of record for the said County, proceeding according to the course of common law, with a civil jurisdiction unlimited in point of amount, keeping a record of their proceedings, and having, in certain cases, the power of fine and imprisonment, Seth Carey, aged 74 years, resident in Putney in said county, who, being first duly sworn according to law, doth, on his oath, declare that he served in the Revolutionary War as follows: three years service in the Massachusetts line in Genl. Patterson's Brigade, Col. Bradford's Regiment, Capt. Reading's Company. That he has received a pension under the act of the United States of the 18th March, 1818, that the number of his pension certificate is 111, and the date of the original declaration is the 3rd day of April, 1818, AND I DO SOLEMNLY SWEAR, That I was a resident citizen of the United States on the eighteenth day of March, one thousand eight hundred and eighteen, and that I have not since that time, by gift, sale, or any manner whatever, disposed of my property, or any part thereof, with intent thereby so to diminish it, as to bring myself within the provisions of an Act of Congress, entitled "An Act to provide for certain persons engaged in the land and naval service of the United States, in the Revolutionary War," passed on the 18th day of March 1818 : And that I have not, nor has any person in trust for me, any property or securities, contracts, or debts due to me; nor have I any income other than what is contained in the schedule hereto annexed, and by me subscribed. SCHEDULE of real and personal estate, necessary clothing and bedding excepted. I am in possession of a household estate of about twenty five acres, with a small poor house on the same, the whole of which would not rent fore more than twenty dollars per annum, one old brass kettle worth two dollars, one old pair fire dogs worth one dollar, one crane worth about one dollar, one axe worth about 75 cents, one hoe worth fifty cents. AND I do also swear that my occupation is that of a farmer, that I am in my 74th year, and am unable to do but very little work, am owing sundry small debts amounting to about sixty dollars. SWORN to and DECLARED in open court on the twentieth day of June, A.D. 1820, before Phinehas White. JUDGE. I, James Elliot, Clerk of the County Court for the County of Windham, in the State of Vermont, do hereby certify that the foregoing oath, and the Schedule thereto annexed, are truly copied from the files and records of the said Court, and I do further certify that it is the opinion of the said Court that the total amount in value of the property exhibited in the aforesaid schedule is seven dollars and twenty five cents, and a small incomee of real estate, twenty dollars. ON testimony whereof I have hereunto set my hand, and affixed the seal of the said Court on this twenty first day of June, 1820. James Elliot, CLERK OF THE COURT FOR THE COUNTY OF WINDHAM." Madeline Bechtold, "Seth Carey & wife Lydia," e-mail message from e-mail address to Steven G. Levine, 5/22/2004 4:17:06 PM. Madeline Bechtold, "Seth Carey & wife Lydia," e-mail to Steven G. Levine, 5/22/2004 4:17:06 PM, citing Dighton deeds, Vol. 55, page 184. Madeline Bechtold, "Seth Carey & wife Lydia," e-mail to Steven G. Levine, 5/22/2004 4:17:06 PM, citing ancestry.com's database taken from: Secretary of the Commonwealth. Massachusetts Soldiers and Sailors in the War of the Revolution, - Vol. I-XVII (17). Boston: Wright and Potter Printing Co., 1896. Volume 3, page 92. Madeline Bechtold, "Seth Carey & wife Lydia," e-mail to Steven G. Levine, 5/22/2004 4:17:06 PM, citing ancestry.com's database taken from: Secretary of the Commonwealth. Massachusetts Soldiers and Sailors in the War of the Revolution, - Vol. I-XVII (17). Boston: Wright and Potter Printing Co., 1896. Volume 3, page 178. Madeline Bechtold, "Seth Carey & wife Lydia," e-mail to Steven G. Levine, 5/22/2004 4:17:06 PM, citing VERMONT MEN IN THE REVOLUTIONARY WAR, p. 408. Letter from A. D. Hiller to Ralph M. Stoughton, R.F.D. Gill, Turner Falls, Mass. , 28 Feb 1938;. 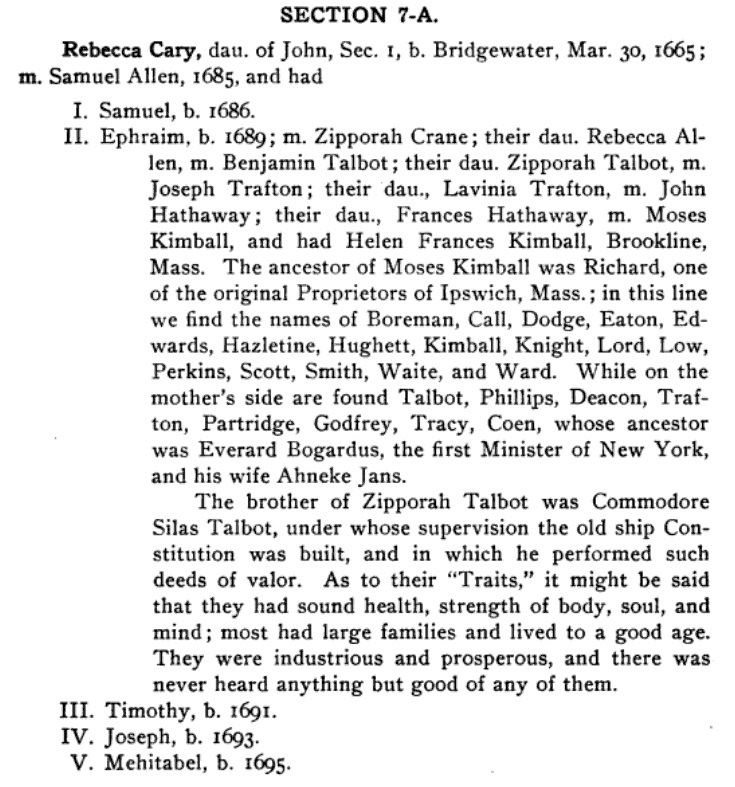 Seth C. Cary, John Cary, the Plymouth pilgrim, Boston, Massachusetts: (1911) , p. 175. Seth C. Cary, John Cary, the Plymouth pilgrim, Boston, Massachusetts: (1911) , p. 122 says 17 Mar, p. 175 says 7 Mar.